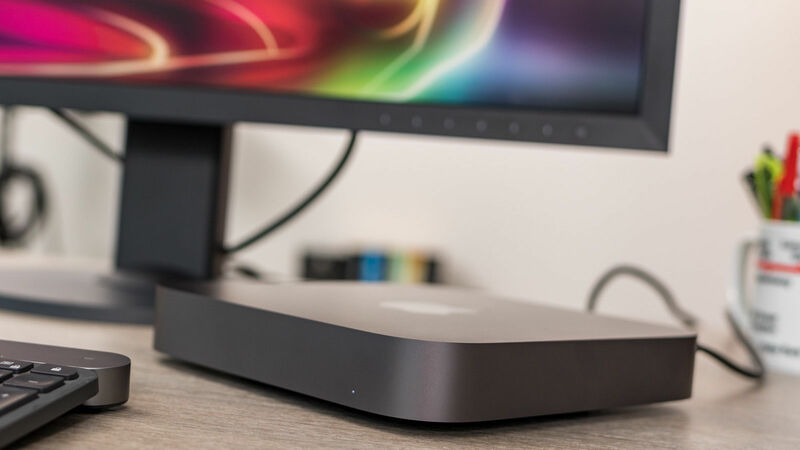 The Mac mini may be the perfect desktop for graphic and UX designers who won’t mind its lack of 3D power. The Mac mini is another engineering marvel from Apple. Garlic bread-box sized, Apple has somehow managed to fit almost a full workstation spec inside that makes it as powerful as leading larger desktops for many tasks – but its lack of one important component limits its appeal to a specific audience. It’s small size makes you think you could give you desk a Marie Kondo-inspired makeover – paired with a minimalist monitor, Apple’s pared-down keyboard and mouse (which you have to buy separately), a few tastefully chosen books and bits of tech that pack themselves away neatly. In practice though, unless you’re the strictly disciplined type, the Mac mini just gives you more space on your desk to fill with print outs, references, desktoys, too many pens and other junk – all peppered with Post-it notes. Many small PCs feature laptop processors as they don’t have the cooling capabilities of full-sized chassis – and this is true of the Mac mini too. 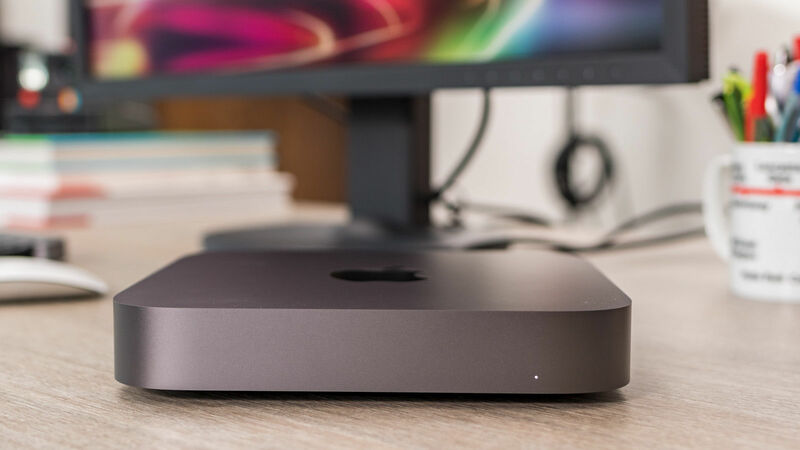 However, the Mac mini has the kind of laptop chip you’d get in an oversized, 17-inch model processor that delivers much higher performance than kind of chips used in slimline 15-inch models we usually go for such as the MacBook Pro or Dell XPS 15 (a 65W ‘B’ model to the MBP’s 45W ‘H’ model chip-nomanclature/power-usage fans). So an i7 Mac mini can outperform an i9 MacBook Pro, which is a little jarring. Here we've benchmarked our high-end review Mac mini against an equally high-spec MacBook Pro, plus our choice for the best laptop for designers and artists, the Dell XPS 15. We've used the new Cinebench R20 processor benchmark – which is based on Cinema 4D R20 – plus the older R15 version (which primarily shows just how outdated that benchmark is). 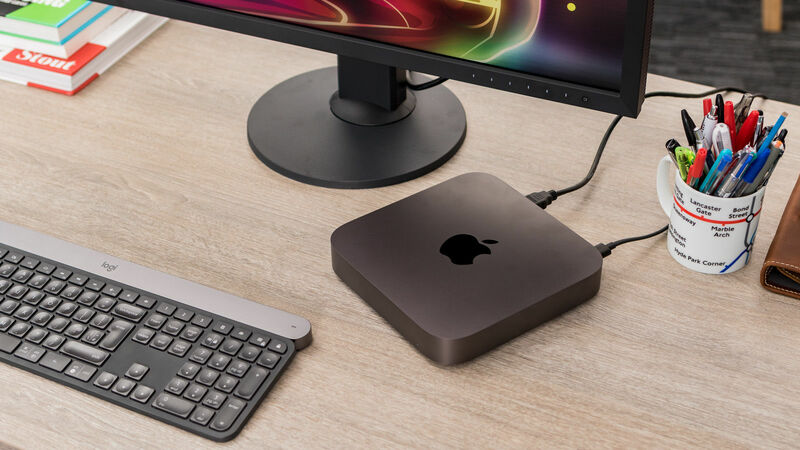 The Mac Mini has an Intel Core i7-8700B 3.2GHz 6-core chip, 32GB RAM, 1TB SSD, Intel UHD Graphics 630 and 10Gb Ethernet, and costs £2,419/US$2,599. The MacBook Pro has an Intel Core i9-8950HK 2.9GHz 6-core chip, 32GB RAM, 2TB SSD, AMD Radeon Pro 560X graphic with 4GB RAM, a 15.4-inch, 2,880 x 1,800 screen and costs £4,409/$4,699. The Dell XPS 15 has Ban Intel Core i9-8950HK 2.9GHz 6-core-chip, 32GB RAM, 1TB SSD, Nvidia GeForce GTX1050Ti graphics with 4GB RAM, a 15.6-inch, 3,840 x 2,160 touchscreen and costs £2,309/$2,909. Our review unit has an eighth-generation 3.2GHz, six-core Core i7-8700B processor that can scale up to 4.6GHz using Turbo Boost. Ninth-gen desktop chips were launched in autumn 2018, but laptop equivalents aren’t due to the summer – so we’re not likely to see an upgraded Mac mini straight after the recently upgraded iMac. The Mac Mini supports up to 64GB of RAM, though pricing goes up dramatically over 16GB. You can save money by getting the 8GB model and installing RAM bought from the likes of Crucial – where 32GB of RAM will cost you £187/US$203, compared to Apple charging you a whopping £540/$600 – but this requires specific tools and some skill (and these instructions). Storage options are a choice of very fast name drives, but also gets pricey once you get past 512GB – so instead of getting the 2TB you might want to consider getting an external Thunderbolt 3 drive. For less than the price of upgrading the Mac mini from 512GB to 2TB, you can get a LaCie 16TB 2big Dock RAID. Round the back there are a full set of ports – four Thunderbolt 3 ports (which you can use an adapter with to connect a monitor over DisplayPort for 10-bit colour), HDMI 2.0, two USB 3.0 ports, Ethernet (gigabit as standard, ours has full 10Gb, which adds £90 to the price) and a headphone jack. This is as good as it gets when it comes to connectivity, whether you want to connect fast storage or work on larger projects that live on your network. So what’s missing? In a word, graphics. The Mac mini doesn’t have a separate graphics chip, instead using the Intel UHD Graphics 630 that’s built into the CPU. Whether this matters depends on what work you do. If you work primarily in graphic design or UX apps such as InDesign, Adobe XD or Sketch – which have no GPU acceleration – it’ll make no difference at all. 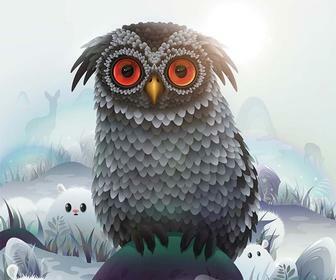 Photoshop or Illustrator are GPU-accelerated to some degree. 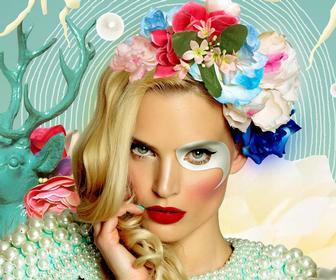 Processing of intricate vector compositions or PSDs with hundreds of layers will benefit from a full graphics chip/card – but as you can see from our Photoshop benchmark tests, the Mac mini gets better results than laptops that do have discrete graphics chips. This is because of the higher-class CPU. 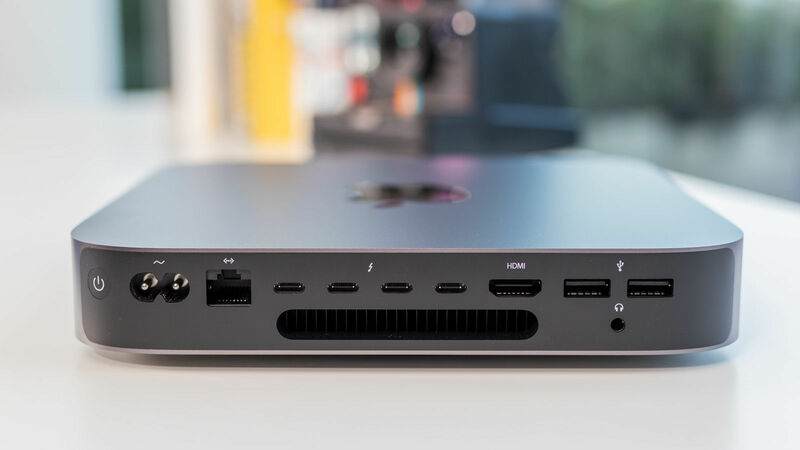 Moving over to mediums where GPU acceleration really helps – 2D and 3D animation, video editing, motion graphics and the like – and the lack of a GPU really hurts the Mac mini’s performance. 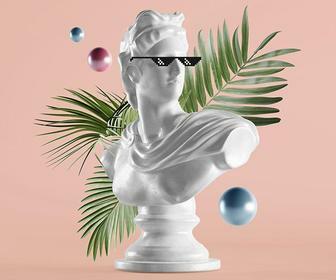 Using Cinema 4D R20’s GPU-accelerated ProRender renderer – which can be used as an indicator of both real-time 3D performance with big scenes and GPU-accelerated processing of 2D video filters, effects or output encoding – the Mac mini was three times slower than a MacBook Pro or equivalent Windows laptop. You can add an external GPU such as the Blackmagic Design eGPU or eGPU Pro, but that can raise the cost and amount of desk space to the point where you might as well consider a full-size desktop. It’s therefore hard to recommend the Mac mini to anyone who works with video or animation. Though if Apple made a scaled up version about the same size as the current aging Mac Pro – but with the aesthetic of the Mac mini rather than that of a shiny waste paper bin, and accessible components including a full sized graphics card with the option of Nvidia boards for those apps that are tied to its CUDA platform (and 9th-gen desktop chips with an i9 chip option) – we’d likely heartily recommend that. If, however, your primary tools are Photoshop, Illustrator, InDesign, XD, Sketch, InVision, Affinity or any other graphic or UX design tools – and you’re in the market for a desktop rather than a laptop – the Mac mini is a powerful, slickly designed system that offers much more than you’d expect from its size. The same is true for its price, as long as you’re content with 16GB of RAM or upgrading to 32GB yourself.